‘Parent’ refers to parent or carer throughout this website. 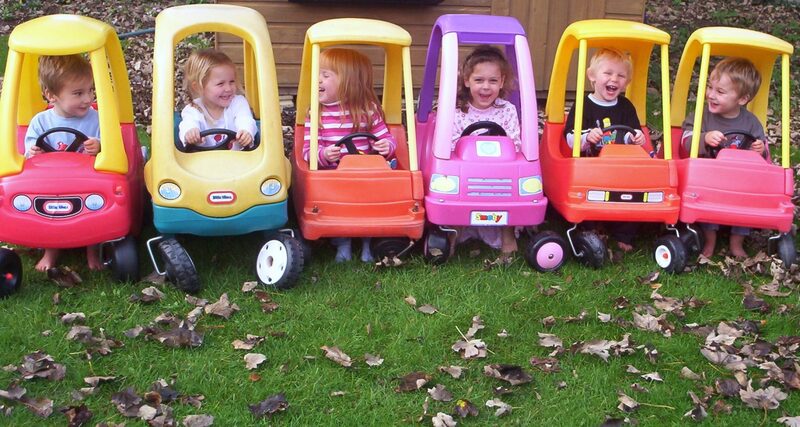 We are a nursery based in a large family house within walking distance of Guildford town centre. We look after a small group of approximately sixteen children (babies up to five-year-olds mainly). The business is owned and run by Cambridge law graduate, Mrs. Sandra Easton, who has the coveted Early Years Professional Status (2010). The team of staff provide excellent childcare with lots of individual attention. Many children start off as babies and stay until they go to school, as we offer all the activities that a big nursery would, but with far fewer children. Parents comment that they didn’t know such ideal childcare existed – hence our overwhelming popularity. The children enjoy a range of indoor and outdoor activities, e.g., painting, play doh, arts and crafts and cooking. The babies tend to dictate their own routine so that they are able to eat/sleep when needed in a flexible routine, and they tend to be very contented because they are given so much attention. Right from the beginning each child has an Early Years Foundation Stage (EYFS) learning journey folder, which contains photos of the child at the setting and observations of the child, including the next steps to be carried out to bring on the child’s development. Each parent is provided with a brief outline of its provisions so we can work together to help the child’s development and achieve their highest potential. We help children develop by activities involving the alphabet, numbers, shapes, colours, etc., and also I.C.T. skills appropriate to the age of the child. We encourage problem solving (on own or as a group) plus creative thinking. We carry out a lot of activities involving different cultures and teaching children about the world. The children are encouraged to be active and enjoy physical exercise, e.g., running in the garden, playing on the swing or slide, riding around in one of the 9 Little Tikes cars available, skipping, hopscotch and more. The manager’s Nutrition Certificate enables top class healthy meals to be prepared. The extensive menu is shown to the parents (including a wide variety of foods, e.g., mild Indian curry and Chinese dishes). Regular healthy snacks are provided to encourage energy and water is available all day. There is a separate fridge (at the correct temperature and correctly stocked) just for the children. Hot meals are probed with a food probe and the temperatures are recorded. The children are instructed about which foods/drinks are healthy and general nutritional advice is imparted. Each child’s record form is consulted to assess the individual’s dietary and medical needs, e.g., allergies and food intolerances. The nursery is a nut free zone. The Nursery ensures that the planned activities help children progress towards Early Learning goals, and the children themselves with their various achievements provide proof that the nursery and the and parents’ joint planning and interaction work extremely well. Good outcomes are achieved with the children learning to think critically and the children are active and creative learners in their play and exploration. Happy learning experiences are provided and children achieve as much as possible in relation to their starting points and abilities. We aid children’s personal social and emotional development by activities (both adult-led and child-led) that help children feel good about themselves (which includes realising how much they can achieve), respect others (social skills, including good manners) and encourage children to want to learn. We encourage activity and produce opportunities to improve co-ordination and movement. Creative development is aided by lots of painting, Play-Doh, gloop play, dressing up, and more. Each child’s individual folder records any achievements, however small, of each unique child and all achievements/actions are checked with the Early Learning goals. The Nursery takes a critical approach to learning and development and understands what helps such learning by checking the learning journey, the EYFS literature and other such sources. Each activity carried out is assessed and evaluated afterwards to see if it can be improved. Messy play is particularly important at this setting. There is a sand and water tray, in the garden and indoors, as the children love to have access to sand. Making marks in sand, cornflour, paint, etc., is very important at the setting and also the freedom to access activities whenever the children want. There is lots of child initiated play (especially imaginative play) as well as adult initiated play. 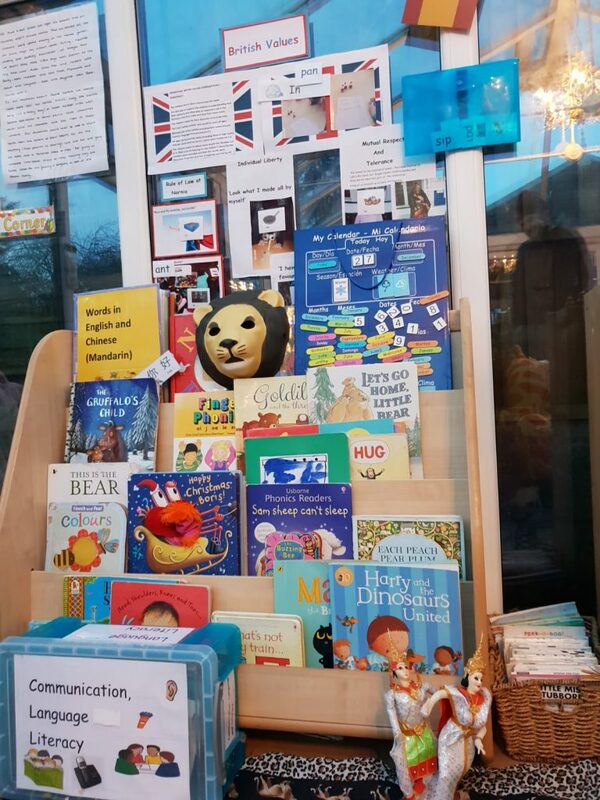 Each parent receives a Newsletter, explaining about the Early Years Foundation Stage and describing the areas of learning and development: Personal Social and Emotional Development PSED, Communication and Language and Physical Development are the 3 prime areas. Literacy, mathematics, understanding the world and expressive arts and design are the specific areas. The parents are notified from the outset that, as we are working in partnership with the parents, they are highly involved in the observation assessment and planning process for their individual child’s planning to provide the best activities to enable their child to achieve and progress. In the newsletter the parents are asked about the particular interests of their child at home and the child’s interests at the Nursery are observed. This enables the Nursery to provide an individual plan for the child so that activities are planned using the seven areas of learning and development revolving around the child’s particular interests as evidenced by the parents written notification of the individual child’s interests. The Nursery operates a highly successful key worker system where each child is allocated a key worker and a backup key worker. Each key worker has a key worker folder where observations are kept until the follow up activity (i.e., The Next Steps) is carried out so that the manager can check that not only are the observations carried out, but also very importantly that the follow up activity is carried out. Then the two stage process, i.e., observation and assessment sheet and the next steps sheet, are filed in the Early Years Profile of each child. The Nursery ensures that the cycle of observation assessment and planning is continuous. The paperwork is exceptional as the manager has the background of being a lawyer. The Nursery ensures that the planned activities help children progress towards the Early Learning Goals and the children themselves with their various achievements provide proof that the Nursery and the parents’ joint planning and interaction works extremely well. Good outcomes are achieved with the children learning to think critically, and the children are active and creative learners in their play and exploration. Happy learning experiences are provided and children achieve as much as possible in relation to their starting points and abilities. We aid children’s personal, social and emotional development by activities (both adult-led and child-led) that help children feel good about themselves, which includes realising how much they can achieve, respecting others (social skills) and encouraging them to want to learn. EXAMPLES: Learning about sharing, taking turns and manners (e.g., saying “Please” and “Thank you”). We talk to the children a great deal and listen carefully. We read to the children a lot and help with arts and crafts and writing i.e., communication, language and literacy skills. We provide adult and child led activities to help with Maths, e.g., number puzzles, number cards and games, shape sorters and general puzzles. We encourage activity and produce opportunities to improve co-ordination and movement – garden play, running races, 9 Little Tikes cars, swing, slide, trampoline, etc. We teach children how important a healthy diet and exercise are, i.e., helping promote physical development. EXPRESIVE ARTS AND DESIGN is aided by lots of painting, play doh, gloop play, mud play, dressing up, etc. Each child’s individual diary records any achievements, however small, of each unique child and all achievements and actions are checked with the Early Learning goals. Our ACTIVITY PLANNER includes activities that a particular child finds difficult, e.g., hopscotch, and also activities for children who are achieving beyond what is expected, .e.g., more difficult puzzles/games, more demanding numeracy or literacy tasks. Activities are carried out both indoors and outdoors. The children move freely in and out of the large well stocked garden, etc. With OBSERVATION AND ASSESSMENT we are continually observing and assessing. We observe children’s amazing development from small dependent babies through to curious toddlers and into small independent children (competent learners) whose speech is developed, who show great enjoyment (and excitement) in learning and who are confident in their abilities and are respectful to others. Individual planning covers children of all cultural backgrounds and all abilities, so each unique child is supported in the best possible way. The provision is EXCEPTIONAL/OUTSTANDING in helping the children achieve the 5 EVERY CHILD MATTERS OUTCOMES, to be safe, healthy, enjoy and achieve, make a positive contribution and achieve economic well-being. The Nursery is exceptional at ensuring that the welfare of the children is paramount. 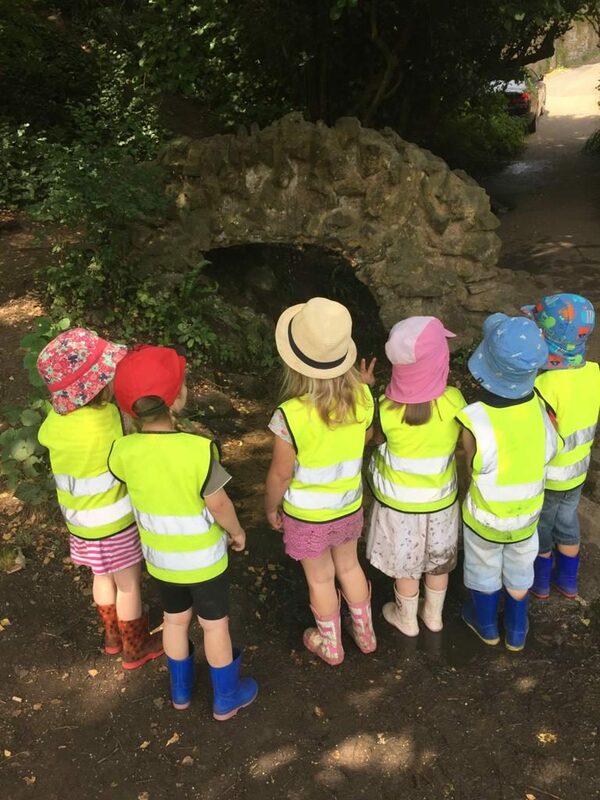 Children at the fairy bridge – on a forest school trip, run by forest school leader, Gillian. The manager is extremely ambitious regarding her own achievements, those of her team and the children’s outcomes and in her working partnership with parents. The setting has a STAFF EMPLOYMENT POLICY and each member of staff is taken through the written STAFF INDUCTION. The setting has over 40 policies and procedures in the POLICIES FOLDER which each member of staff reads and signs each policy to say that they have read and agree to carry out the setting’s policy. Each policy is signed to say it has been written by Sandra Easton and has a review date in 6 months time from the policy being prepared. She regularly elaborates her vision for top quality childcare for each unique child through team meetings, written documents and discussion, asking the team members for their views, so that the business is a truly REFLECTIVE PRACTICE…so each team member’s views are valued in order that we work together to continually improve and refine our service. Our team continually self- evaluate, and the manager has an excellent approachable style with her team members whom she leads and manages effectively. She makes sure that targets are realistic but also stimulating, challenging and attainable. There is an excellent system in place for tracking, monitoring and analysing improvements to the setting and the effects on individual children. The manager checks on the implementation of plans and policies and adjusts the same if matters have changed. The totally reflective and ambitious practice ensures that children’s outcomes will be improved by our improvements/changes being implemented. Childcare here is idyllic for every child regardless of background…with superb facilities. Our admissions policy and procedures are inclusive, and we aim to give each child regardless of background/ability amazing care and education. The setting was attended by a child whose first language was Afrikaans and we asked the Mum for a list of words/expressions that the child used in Afrikaans as although the child understands English she mainly speaks in Afrikaans…by the Manager and staff using some of the Afrikaans words the child was able to feel more at home and settled easily. Another child was Italian so we held an Italian session where the children made Pizza dough added the toppings and had an Italian lunch…we also made Italian flags, played Italian music and pointed out Italy on our world map. We work exceptionally well in partnership with parents to meet children’s individual needs. Sometimes the manager goes to a child’s home to get to know the family before the child attends or sometimes a child who already attends the setting will ask for the Manager to go to his or her house for tea as the child really feels that Sandra is part of his or her family…as the setting has such a home from home atmosphere. All toys/activities are available for all children regardless of gender, race, etc., and resources are in low cupboards for ease of access. We offer a very welcoming service. In return, parents are very confident sending a child here. No individual is disadvantaged but is supported regardless of background/race/gender/disability. The manager is exceptionally competent at promoting inclusion and ensuring that her team also understand the importance of making every child and parent welcome and feel included. We celebrate festivals/special events from many religions, and all parents are invited to our annual Christmas party. Christmas parties are attended by many parents and even Grandparents. The nativity play one year was very popular. Father Christmas gives out presents and we are inundated by many thank you cards, champagne, chocolates, biscuits and numerous other gifts as tokens of appreciation for the wonderful childcare that the setting provides. In March 2010 two of the team attended a two day equality and diversity workshop. We provide a safe and secure environment…risk assessed daily. Sick children are sent home and kept at home for 48 hours after last bout of sickness/diarrhea. Written records maintained daily…all policies and procedures including complaints procedure are in place (Ofsted poster on wall). Assistants are Police checked (C.R.B./D.B.S), Ofsted approved, given rigorous training and references are taken up. The Manager and one of her team attended a SAFEGUARDING “What If” course in 2009 and the Manager and her team are fully knowledgeable about the procedure to be followed if they suspect a child is being abused. The Designated Safeguarding Lead (DSL) and Deputy DSL have attended have attended Module 1 and Module 2 training, and the update in 2013. A policy is in place and the latest information booklet in place. Regular meetings are held to implement comprehensive safeguarding. The manager regularly asks the parents/children for their views and implements the suggestions as appropriate. The prospective parents undergo setting visits and the parents are asked to provide extra written information on their child as well as completing the usual standard child record form; also extensive verbal discussions are encouraged. Settling in sessions are recommended and diary reports are provided daily and placed in the child’s diary where parents are encouraged to reply and comment. 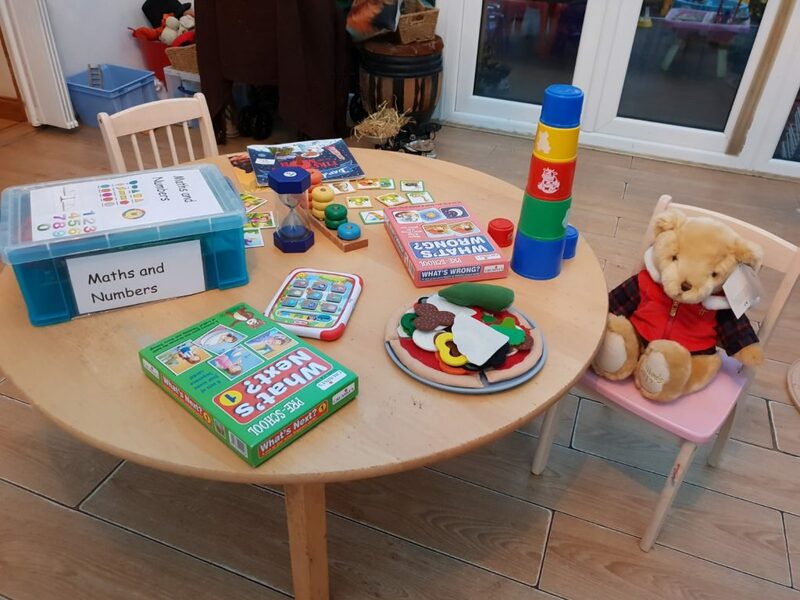 The Early Years Learning Journeys are regularly sent home for the parents to see and so that the parents are involved in the partnership to ensure that their child’s learning and development is of the best possible standard. Pieces of “work” are sent home a lot so parents can see and praise their child’s achievements and so that parents, the manager and her team are all looking to extend their child’s learning process. The manager and her team liaise very closely and are continually assessing the standards of childcare provided so the provision remains outstanding. We have regular STAFF MEETINGS to discuss both adult-led and child-led activities and discuss the children individually so that we tailor make any activities we feel would benefit a particular child. We ask parents for CONSTANT FEEDBACK (verbal feedback, notes parents may make in a child’s diary and reviews for the comments book). We also base our work on the children’s opinions. We observe and assess the children to plan experiences(taking into account differing backgrounds). On each child’s RECORD FORM, details of who may collect the child are recorded (including a password to be given). Parents fill out an INFORMATION ABOUT ME SHEET giving as much information as possible in minute detail, e.g., favourite toys/family members/sleep routines, etc. The setting is in a huge detached house with a very large garden. It is close to Guildford town centre and has exceptional facilities. The accommodation is extremely spacious and there is free flow access throughout the rooms and from the large conservatory into the superb garden. The conservatory brings in so much light that it feels as if the children are outdoors even when inside, stressing our belief in the importance of an indoors/outdoors nature. The garden features our African garden which is surrounded by logs the children sit on for story time. The African garden exhibits, e.g., snakes wound round trees, parrots,a giant giraffe, wooden African masks and other features to delight the children. Also with the emphasis on a mini forest area, the setting has a small “wooded area”, so the children can follow the woodland nature trial, where they see masks of badgers, owls and foxes, etc., and where the children can engage in a favourite activity of theirs, bug hunting, with magnifying glasses and binoculars. The children also have an area of their own in the garden, where they plant vegetables, herbs, pumpkins, etc., and when the season dictates,harvest them for their meals Since the last Ofsted inspection in 2010, the setting has gained the addition of a vast covered area, built from wood and perspex,known as “the Gazebo”, which is a permanent feature and emphasises our belief in the importance of free flow outdoors. The area has twinkling lights round the roof of the “gazebo”, which in Winter months provide a very exciting area for the children as darkness descends. Usually 16 children a day. Open 8am till 6pm Monday to Fridays 52 weeks a year. Only closed on Bank holidays. The setting is in the home of Sandra Easton who is the Owner of the house and Manager of the setting, though the nursery is in a self contained wing of the house. Prior to being registered as a nursery in September 2010, Sandra has been a Registered Childminder since May 1996, and subsequently working with assistants, …gaining the OUTSTANDING GRADE in 2008… In 2009 she joined the Surrey Childminding Network and was QUALITY ASSURED under the N.C.M.A scheme. She retains the childminding registration, e.g., if only 3 children, she may use her childminding registration number EY120617. The setting is aware that the safeguarding of children is of paramount importance. Sandra Easton is the appointed Deputy DSL and she initially attended the “What if ” course, now known as “Working together” and completed Module 1 (safeguarding ) and Module 2 along with Gillian Wadsted the DSL. The DSL and Deputy DSL attended a DSL Safeguarding update course in 2013 and 2015, as the updates for DSL and Deputy DSL must be completed every two years. Sandra Easton (Manager) and Tracy Sturge (Deputy Manager) completed the Developing Quality through your Staff workshop in May 2010 (a 2 day course). The Manager and Deputy Manager attended Supporting Children’s Behaviour course in January 2011. Rebecca Rose is the appointed SENCO and completed the new SEND training in 2015. The Deputy Manager and a staff member attended the Diversity and Inclusion workshops in March and May 2010. Two staff members attended a “Safer Recruitment for Managers” course in January 2011 as the setting is rigorous in its recruiting process. Full time or Part time. Also we have at the setting a child aged 2, who is trilingual, speaking English, German and Norwegian. The setting is exceptional in providing childcare for children with English as a second language, requesting from parents a list of words familiar to the child in his or her first language which the Manager and staff can use to help the child settle in well. One of the children who had poor speech for his age has improved immensely since attending the setting. We continually assess and monitor the children and take painstaking care to observe each unique child and support them, using the highest standards possible. Our priorities are to maintain the happy atmosphere and friendly Nursery which is absolutely unique in the area for providing a HOME FROM HOME ENVIRONMENT. To help children to realise the immense satisfaction that can be obtained from learning. It is a safe and stimulating environment, as a parent has said. We will continue to maintain the safety of the children at all costs and ensure our risk assessment is rigorous. We maintain standards to ensure the health of children. Use the garden as much as possible and whenever the children want to promote physical exercise. We continue to ensure children from different ethnic backgrounds or with a disability/learning difficulty (or who learn English as a second language) are given the necessary support so they understand how to be healthy. One of our priorities is to aid confidence so that children approach the future with the appropriate skills. One Parent commented how much the childcare had built up their child’s confidence. The priority is to maintain the highest standards…to provide what one parent described as IDYLLIC CHILDCARE. A COMMENTS & TESTIMONIALS BOOK is kept for parents’ and childrens’ views of the childcare provision. Inside the Comments and Testimonials Book is a collection of written testimonials from parents, e.g., those submitted to Kingston University as part of the Early Years Professional Status course ) describing the childcare as SUPERLATIVE, OUTSTANDING etc. Written reviews for the comments book are regularly requested. In addition regular discussions are held with the parents to find out what they think about the childcare provided, so that we can continually strive to monitor and improve our standards. Also regular discussions with the children to guage their opinions which are obviously extremely important. In the comments book are some amazingly complimentary views from some of the children on the childcare provision. Other Comments vary from, e.g., this is the best childcare in Guildford through to a parent expressing that they have complete peace of mind and are confident that they could not have found better for their child. Apart from face to face meetings/discussions, telephone conversations texting etc,there is a unique and highly impressive system in place whereby each child goes home each day with a report showing activities meal, etc., which we file in their diary. This is in addition to the records provided in the Early Years Nursery Profile which parents can access at any time. A highly successful addition to the setting has been the MUMMY/DADDY/CARER WALL where parents are encouraged to bring in photos of themselves and siblings so that the children are able to look at their parents’ photos, which has been particularly helpful when settling in a child, when we can hand the child the photo of his or her Mummy and Daddy. The parents have loved this feature. Also popular is the self registration scheme and the visual timetable. The parents and children have also greatly appreciated VISITS from the community, e.g., the fire brigade and local police which parents have been invited to and photographic displays have been put up on the wall. Also the parents received photos of themselves and their child when the Fire brigade or Police were here. In fact, the parents are regularly given photos of their children to keep. Parents have also been very impressed with the fantastic wall displays,on varying topics. In June 2012, one of our parents of a child who used to attend the setting asked the owner/manager of the setting, Sandra Easton, to be Godmother to her child…compelling evidence of the amazing relationship/partnership with parents. A wonderful accolade, demonstrating the outstanding care at the setting. The house and garden are an extremely safe environment. Anyone attending the setting is vetted and signs in the VISITORS BOOK. No one is left on their own with a child unless they are a CRB/DBS checked member of staff. As mentioned above the safeguarding procedures are exemplary. Firstly as to staff recruitment as above and secondly all staff attend the “What if.. now known as Working together”courses and updates every 3 years and the DSL and Deputy DSL attend the DSL update course every two years. The Manager has ensured that each and every member of staff knows what to do if any form of abuse is suspected. Speak to the DSL or Deputy DSL. The telephone number to report any possible concern is on a poster on the wall. Also the setting has a comprehensive policy and procedure on safeguarding in the Policy Folder, which details matters such as the procedure on a member of staff being accused of abuse (a separate telephone number is on the poster in The Safeguarding Corner – staff know they can ring the telephone numbers themselves. Risk assessment is carried out twice daily (Written check-list initialled by staff) checking the premises plus equipment and toys for safety and cleanliness. The Nursery is registered with the Environmental Health and advice taken by a Fire Officer (confirmed in writing ). Appropriate fire extinguishers and fire blankets are in place. Regular FIRE DRILLS are undertaken. SMOKE ALARMS (mains operated + battery back up) + carbon monoxide monitor in place. Portable appliances are tested as required by rules. We teach the children about possible dangers e.g. electric sockets, kettle, trapping fingers in doors, danger from putting small objects in mouths, i.e., choking dangers,etc. EVIDENCE provided by a parent is that one parent thanked us for providing such a happy and SAFE environment for her child, helping her to “flourish”. The setting is extremely clean and well organised. Nappies are double bagged and disposed of immediately in dustbins…disposable gloves used. Diet … Nutrition Certificate enables top class healthy meals to be prepared. Extensive menu shown to parents (includes a wide variety of foods, e.g., mild Indian curry, Chinese dishes). Regular healthy snacks provided to encourage energy. Water available all day. Nut free zone. Separate fridge just for the children (correct temperature and correctly stocked). Hot meals are probed with a food probe and temperatures recorded. Illness… Top quality care to protect health, i.e., Policy that sick children are excluded for 48 hours to prevent spread of infection. FIRST AID BOX Extensive..extra large…very well stocked (plus travel first aid kit for outings) Accident book to record any accidents/existing injuries/concerns/incidents/medicine requests. Emergency consent form for emergency treatment. Children are encouraged to be active and enjoy PHYSICAL EXERCISE, e.g., running in the garden, playing on the swing or slide, riding around in one of the 9 Little Tikes cars available, skipping, hopscotch, etc. Children are taught to wash hands after the toilet/potty, before meals and after garden play (paper towels provided for drying hands). They are instructed about which foods/drinks are healthy and general nutritional advice is imparted. Each child’s record form is consulted to assess the individual’s dietary and medical needs, e.g., allergies, food intolerances. Sleeping babies/toddlers are checked every 10 minutes and the information is recorded and initialled on a sleep chart. Each child obviously has own bedding (in a seperate basket for each child). We help children learn well and think of others as well as themselves. We ensure that they contribute, make friends and have respect for all children from every background/ with different needs. We enable them to share. be kind, polite, respectful and make suitable choices. We are very aware that children from differing backgrounds or with disabilities/learning difficulties, etc., need to have the opportunity to experience the same learning/development scheme. Resources …an extremely wide range of toys and resources from baby toys up to large items e.g., swing/slide are available. Resources are all accessible, i.e., housed in low cupboards or in baskets/containers so children can pick and choose whatever they want. Child initiated play is encouraged. Children are encouraged to be independent, e.g., pouring themselves and others drinks of water from a jug or from the children’s own water cooler, helping prepare meals or snacks, such as chopping up fruit, laying the table for meals, putting food out for the birds, planting seeds, picking vegetables from the garden. We aid children’s progress towards the Early Learning goals. We help them to “work/play” independently and with others. The setting provides FREE FLOW from inside into the magnificent garden so children can choose freely when they want to be in or out. The garden provides access to activities which promote all 7 areas of learning and development e,g., 9 Little Tikes cars, trikes and scooters, ball games, etc., for PHYSICAL DEVELOPMENT (PD),Sand and Water trays for Expressive Arts and Design (and PD) Large puzzles,hopscotch and large numbers for Maths, Alphabet activities in the garden (COMMUNICATION AND LANGUAGE) and literacy activities, A den which the children helped make, helping PERSONAL SOCIAL AND EMOTIONAL DEVELOPMENT (PSED)as they can chat to each other, take turns with the toy food in the den etc. UNDERSTANDING OF THE WORLD in the garden is provided by a very special area that the children love, called the African Garden:it is hidden under trees where the children can see giraffes, snakes and other animals from round the world and decorated with flags from around the world. We motivate the children so they are keen to learn, to think about what they are doing and talk about what they have learned…and ENJOY LEARNING plus ICT. We enable the children to have good relationships with others and appreciate different needs and backgrounds. The effectiveness of the settings’ self-evaluation, including the steps taken to promote improvement. OUTSTANDING grade achieved. Each child is unique and inclusion is promoted. The business is extremely well organised and we constantly evaluate what we are doing. We work well as a team and discuss different ideas (and individual children’s needs) to create excellent learning experiences. We are extremely conscientious in ensuring that children are safeguarded (policy and procedures in place). We constantly evaluate the childcare provision and discuss with parents with whom we have excellent relationships. The leadership and support is exceptional being a very small and closely knit group of persons who value each others’ opinions. The EARLY YEARS PROFESSIONAL STATUS course has enabled the Manager to perfect her leading and supporting skills in her personal practice. Keep up same standard of fairness for all children …all unique. Be very aware of each child’s needs at all times. Maintain monitor and improve standards. Be a totally reflective practice. We are recommended extensively by Mums and Dads as they know we provide a safe stimulating environment. Recommendations are proof of our high standard of care. We already have a very approachable style so parents feel able to discuss the best method of childcare for their child. Parents like the fact that they can ask us if they are worried about anything concerning their child. As said by one parent “At pick up I am told about my child’s day and any other information I might need to know which is very useful”, plus each child’s daily diary records their day. Continue with highest standard of care. Carry out any updated training eg initially in September 2009 the Manager and Deputy Manager attended the Early Years Foundation Stage seminar to understand the EYFS from the beginning, followed by numerous courses as detailed in this document, e.g., Module 1 and 2, Developing Quality through Staff, Diversity and Inclusion (2 day course) etc. We keep setting new targets, e.g., to add different activities to our already extensive repertoire. The capacity of the provision to maintain continuous improvement We carry out regular assessment of children’s learning and development, including asking opinions of parents, children and assistants. We are continually improving and refining our service. Our plans for the future are well targeted so as to meet the needs of the children in the Early Years Foundation Stage. The Manager and her team interact with other professionals, e.g., health visitors, psychologists, doctors, speech therapists, social workers, childminders, pre schools, other nurseries, etc. Again the EARLY YEARS PROFESSIONAL STATUS course run by Kingston University enabled the manager to improve her leadership skills to enhance the overall learning experience of each individual unique child. Policies are reviewed every 6 months, Risk assessments twice daily,Fire risk assessment filled in monthly plus monthly fire drills (or evacuation drills…evacuation bag with telephone numbers emergency food and drink, formula milk, money books, etc., ready) First aid every 3 years for all staff, Safeguarding “Working together ” courses and updates for staff every 3 years, regular Food hygiene courses. Informal and formal parents meetings. Regular staff meetings. Wonderful huge conservatory which the children can free flow from into the garden (under supervision of course). The conservatory has been superb for the children as it receives a huge amount of sunlight and the children are fascinated when it rained/snowed and they saw the rain/snow on the roof and it gives the children a really seamless experience of being indoors but outdoors simultaneously. The outdoors is extremely important at this setting. The manager will continually strive to improve the setting. Self evaluation is a very accurate reflection of the childcare business as is borne out by EVIDENCE provided by the parents’ written comments mentioned throughout. Plans for the future are well targeted regarding activities, assessments of the children, risk assessment, paperwork, etc. Our setting is exceptionally effective in meeting the needs of the children in the Early Years Foundation Stage. We recognise that each child is unique and tailor activities to meet needs. We ensure that each child (from every background) is supported so that they develop and learn in accordance with the Early Years Foundation Stage. We liaise with other settings. We believe our setting already supports each unique child in their learning/development/care but are mindful of continually refining the childcare service…careful assessments of the children are made, stringent risk assessments carried out, excellent relationships made with the parents and children, paperwork up to date, training and up to date courses, etc.